J.D. Drew (1998-99) — Turns out he’s not the second coming of Mickey Mantle. Nonetheless, an everyday outfielder for 12 years now, with three different teams. More than 200 career homers. Member of 2007 world champion Red Sox and MVP of 2008 All-Star Game. 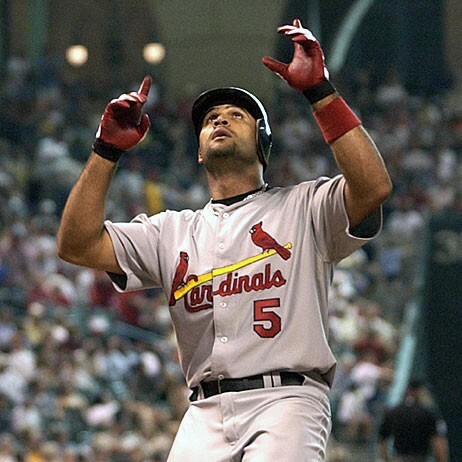 Placido Polanco (1998-99) — Not many saw this career coming when Polanco hit .278 over two seasons with the Redbirds. Part of the deal with Philadelphia that brought Scott Rolen to St. Louis, Polanco has made that trade one of at least equal value. Hit .331 in 2005, a season in which he was traded from Philly to Detroit. MVP of 2006 ALCS for the Tigers, then hit .341 in 2007. A two-time Gold Glove winner at second base, Polanco will surpass 2,000 hits before his career’s over. Adam Kennedy (1998-99) — Remarkably, two members of the 1999 Redbirds won MVP honors in the ALCS. Kennedy hit three homers for the Angels in their series-clinching victory in 2002. Never an All-Star, Kennedy merely built a career as a steady, everyday second-sacker. We’ll forgive him that second stint in St. Louis. Dan Haren (2003-04) — There was Carlton-for-Wise, then Haren-for-Mulder. Worst Cardinal trade in at least 20 years. After appearing in the 2004 World Series for the Cardinals, Haren was sent to Oakland for Mark Mulder, whose career ended with a shoulder injury. Haren has won at least 14 games in each of the last five seasons. A three-time All-Star (now with Arizona), he has twice struck out 200 hitters in a season. Adam Wainwright (2004-05) — Wainwright would belong on the Redbirds Wall of Fame just for his strikeout of Carlos Baerga to win the 2006 National League pennant for St. Louis. But that emergency work as a closer was merely prelude to the command he’s taken of the Cardinal rotation. Since the start of the 2007 season, Wainwright has gone 57-28. Were it not for a blown save in what would have been his 20th win of the 2009 season, he likely has a Cy Young Award in his trophy case. Gold Glove winner last year. Yadier Molina (2004) — Among the finest defensive catchers in the game (two-time Gold Glove winner), Molina’s arm has thwarted would-be base-stealers at a nearly 50-percent clip over his six seasons behind the plate for St. Louis. Hit late-inning home run that helped beat the Mets for the 2006 pennant. Hit .304 in 2008, then .293 in 2009 when he played in his first All-Star Game. Rick Ankiel (1999, 2007) — Won 11 games as a flame-throwing rookie lefty in 2000, only to lose his ability to throw strikes during an infamous meltdown in the playoffs against Atlanta. Worked his way back to the big leagues — again through Memphis — by becoming a hard-hitting centerfielder. Hit 47 home runs for the Cardinals from 2007 to 2009. Will always be a disappointment to those who saw him as the next Koufax, but one of the most compelling baseball stories . . . ever. Two players to watch over the next few seasons: Colby Rasmus and Skip Schumaker. And if Jaime Garcia and David Freese prove their rookie campaigns aren’t a fluke, this wall may get crowded very soon.